Ask anyone for their ultimate list of global destinations and see if you can find someone who doesn’t place Las Vegas somewhere on the list! With its scorching summer heat of 100 degrees Fahrenheit plus, and its casinos, clubs, bars and of course, the infamous Las Vegas Strip. If that’s not enough to occupy you, how about the red rock canyon laying behind downtown Vegas which is a short trip away?! If you want to keep the theme of travelling and exploration going, you can even venture out to see the one and only grand canyon…….how about having a helicopter ride over it? Touching down in Las Vegas is often labelled as a once in a lifetime activity, but ask anyone fortunate enough to have been and they’ll tell you they either, went back again, or are planning a revisit. And who can blame them? How can you do it all in 2 weeks? As I write this, I’m envisioning having a summer job out there; that would surely be the summer of a lifetime. It’s a shame you wouldn’t be able to tell people all about it, Las Vegas has a rule about gossiping, remember?……..
And I’m still yet to touch on the one thing we take for granted in this world; food. Just google ‘Las Vegas food’ and you’ll see PAGES of results informing you of the best places to eat in this stunning Nevada city. There’s steak houses, waffle houses, all you can eat buffets and ice cream parlours. They’ve got something for everyone – and in large quantities; Las Vegas is definitely generous when it comes to food. With all this food talk and the fact that you’re a health and fitness conscious individual reading this, comes the mighty question – the question that I, and every other fitness professional gets asked during holiday season………..
Just how do I stay in shape around all this delicious cuisine? Do I limit myself? Help! Chill out. You’re going to Vegas, remember? How many people, do you think, have wanted to visit Vegas in their lifetimes but never managed it? I wouldn’t like to think about it. So let’s put things in to context and discuss some simple strategies to stay in shape without deprivation on a Vegas holiday! I’m going to be strict here so you don’t have to be when you’re out there. It all starts with 3 simple rules……. Rule #1 – Nothing is ‘off limits’. That’s reckless, you say? I say it’s freedom. It’s experimenting. It’s laying the groundwork to come back with absolutely no regrets. Imagine if one of your co-workers asks you when you get home whether you tried the famous Vegas burger or fried chicken, and you say “no, I should have done though”….live in the moment. Try all foods and regret nothing. If you are healthy and fit, you’ll have spent the months prior exercising and nourishing your body; strengthening it such that it can handle a burger or some doughnuts. A product of Las Vegas. Why would you turn it down? Rule #2 – Drink, but make sure you drink WATER too. Plenty of it. I mentioned how hot it is in Vegas earlier, didn’t I? At those temperatures, especially if you’re not from a hot climate, you’ll lose water through sweating without doing much. Dehydration is not only harmful to health, but it slows your metabolism down and increases your appetite – and particularly your appetite for ‘dirtier foods’. As I said, tastier foods aren’t off limits, but why eat more of them than you actually crave? Drink loads of water – 2.5 litres per day minimum. Rule #3 – Move. Exercise in some fashion. The beauty of Vegas as a holiday hotspot is: it’s so teeming with life and action that it’s very hard to not want to get up and do something. Who’s going to wake up and see the blazing sun trying to tear through the hotel room curtains, and say……”let’s just lay in bed all day?” excluding the hungover, of course. Even if you’re not ‘gym cultured’ you can still be very active. Try and do at least ONE activity that’s physically demanding. Not marathons or triathlons. But how about a wild west horseback ride? Or even a day out at a shooting range? Not enough excitement in those? How about racecar driving, or a hike around the grand canyon? There’s countless theme parks for the thrill seekers, too. With the well deserved popularity of health and fitness in today’s world, more people than we could realise have some interest in keeping fit. 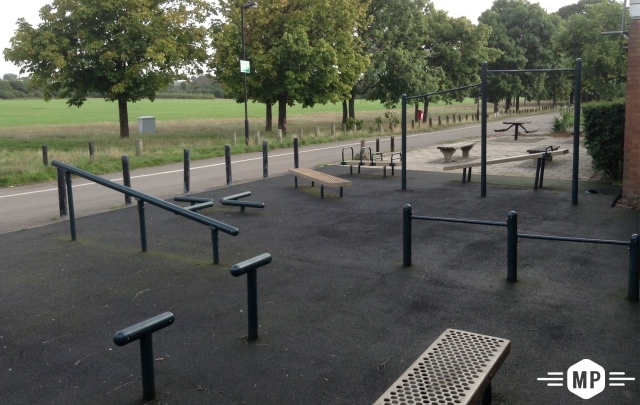 Just take a trip to a local park with some bars and sit beside it for only a half hour; you’ll see numerous people come past and do some pull ups, dips and push ups beside it. If you’re lucky you may see muscle ups and handstands too, maybe even some pistol squats! Depending on how serious you are, you’ll have hunted down a hotel with a gym. If you’re serious about working out, you’ll be following a program too, I’d guess. Now you’re probably expecting me to tell you to carry on following the program. I’m not. I’m going to tell you to tone it down a notch. Being so serious about exercise on vacation/holiday is a bad idea. You’ll be sleeping and eating differently than normal; yet you’ll still expect progress. It’s deep wired in you. I’m the same. If you don’t get progress, you’ll be disappointed. Negative emotion has NO PLACE WHATSOEVER ON A LAS VEGAS TRIP! Or any trip for that matter. We don’t need progress either, not for these 2 weeks. All we need is a short ‘H.I.I.T’ based workout to spike the metabolism and induce some fatigue to all major muscle groups. Your body will not de-train under these conditions. If that’s not got you agreeing, I have one final reason for not being a slave to your normal routine in Vegas: the issue of time. Do you really want to spend an hour + in the gym? Why on earth would you spend time here doing what you could at home?! Why?! With that out of the way, let’s get down to the nitty gritty. I will cover what to do if you don’t have access to a gym, as well as cover some gym options that will take you half an hour, max. I’m going to divide the ideas up into sub categories. The wise person knows simplicity is the key to success and we’re going to use this fact here when it comes to designing a routine you can use which will stand up to the lack of equipment in gym hotels. Saying that though, many Vegas hotels are 4 star and upwards and have some pretty stunning gyms on board! We will be using barbell complexes as our exercise modality which is basically a posh term for circuit training. We’re going to cover all basic movement patterns – a upper body push & pull, along with a lower body push and pull. The structure is equally as simple: you’re going to perform 10 reps in order and rest as necessary between rounds. Set a timer for 20 minutes and see how many rounds (40 total reps) you can manage. If you really want to, you can try to beat it over the course of the holiday. (P.S. If you can get 10 rounds, you’re pretty fit indeed). In terms of weight selection, you let the movement which you’re weakest at determine this. In almost all cases (barring the most extreme anomalies) the bent over row will be the one. Use a weight that’s challenging for 10 reps, but you could get 15 if you had a gun to your head. All isn’t lost! I’ve got a tabata style circuit that can be done anywhere; in the park, in our hotel room, wherever. Tabata is a style of training that uses a 20 seconds on, 10 seconds off recovery scheme which equates to a 2:1 work to rest ratio. Keeping with the theme of simplicity, we’ll use 4 bodyweight exercises with modifications to suit all levels……..
Mountain Climbers – made easier by slowing down focusing on control. Made harder by speeding up whilst maintaining full control. Jumping Lunges – made easier by removing the jump and focusing on speed. Made harder by keeping the jumps on one leg for 10 seconds each side. You will do 2 x 20 seconds of each with 10 seconds between each bout, then rest 90 seconds between rounds and complete a further 3 rounds for a total of 4 rounds. The goal here is density – how many reps can you accumulate in our limited time frame? All it takes is 15 minutes! I would do either of these workouts a minimum of twice per week and a maximum of 4 times per week. Even though I have a heard time accepting 15 minutes is too much out of someone’s day to exercise, if you insist on dodging the gym and even my tabata workout, you had better make sure you do plenty of walking. This applies to the good boys and girls who follow the routine(s) also. Take a stroll out first thing before breakfast. Walk the Las Vegas Strip. It never gets old. Swimming is such an underrated means of exercise, try that. There are loads of lovely pools and water parks all around Vegas. Add them to your to-do list. I will conclude with a word of truth: 2 weeks in a place like Vegas will feel like an hour behind your work desk. It will evaporate fast. Don’t tarnish such an experience by worrying over relatively minor issues such as weight gain and a loss of fitness. Following the suggestions outlined here will guard against any of that. Go out and live it up, baby! Actually, I lived in Las Vegas from age nine to twenty-one and I couldn’t wait to get out of the place. The day my parents retired and moved to Utah was the day I lost any motivation to return to Vegas. There were good times there, don’t get me wrong, but the typical entertainment Vegas has to offer has no appeal for me. I liked what you said about trying the food. It’s true if you only get to go to a place like Vegas once, in your life, you best make the most of it in every way you can. In Life, we tend to regret the things we didn’t do. Absolutely. I’ve learned that the hard way. That’s why I find it really difficult to turn things down now – especially opportunities. the routine. When you return to good old blighty. Yes that’s you James always has good advice.